Returns the paint used to draw the line between the minimum and maximum value items in each category. Returns the stroke used to draw the line between the minimum and maximum value items in each category. Returns the icon displayed for the maximum value data item within each category. Returns the icon displayed for the minimum value data item within each category. Returns the icon drawn for each data item. 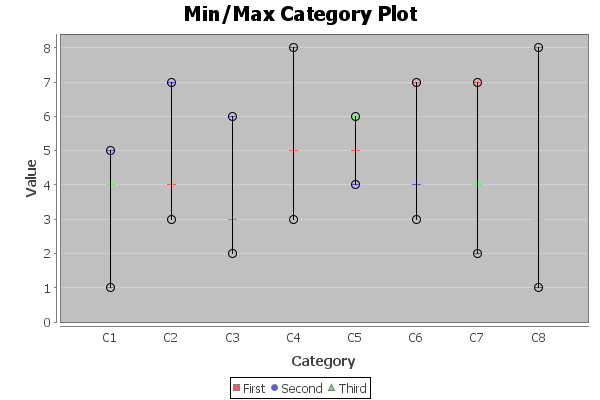 Gets whether or not lines are drawn between category points. Sets the flag that controls whether or not lines are drawn to connect the items within a series and sends a RendererChangeEvent to all registered listeners. Sets the paint used to draw the line between the minimum and maximum value items in each category and sends a RendererChangeEvent to all registered listeners. Sets the stroke of the line between the minimum value and the maximum value and sends a RendererChangeEvent to all registered listeners. Sets the icon displayed for the maximum value data item within each category and sends a RendererChangeEvent to all registered listeners. Sets the icon displayed for the minimum value data item within each category and sends a RendererChangeEvent to all registered listeners. Sets the icon drawn for each data item and sends a RendererChangeEvent to all registered listeners. boolean true if line will be drawn between sequenced categories, otherwise false. draw - the new value of the flag. stroke - the new stroke (null not permitted). icon - the icon (null not permitted). dataArea - the area in which the data is drawn. Tests this instance for equality with an arbitrary object. The icon fields are NOT included in the test, so this implementation is a little weak.